Located 24 miles south of Portland and 30 miles north of Salem, the small town of Aurora, with a population of 918, is surrounded by farmland. Perhaps, that is the reason why their three attractions are connected with agriculture. Dr. William Keil, born March 6, 1812, at Erfurt, Prussia (Germany) immigrated to New York City in 1831 but found the area too confining. He heard that large groups of his fellow Germans were colonizing Western Pennsylvania. 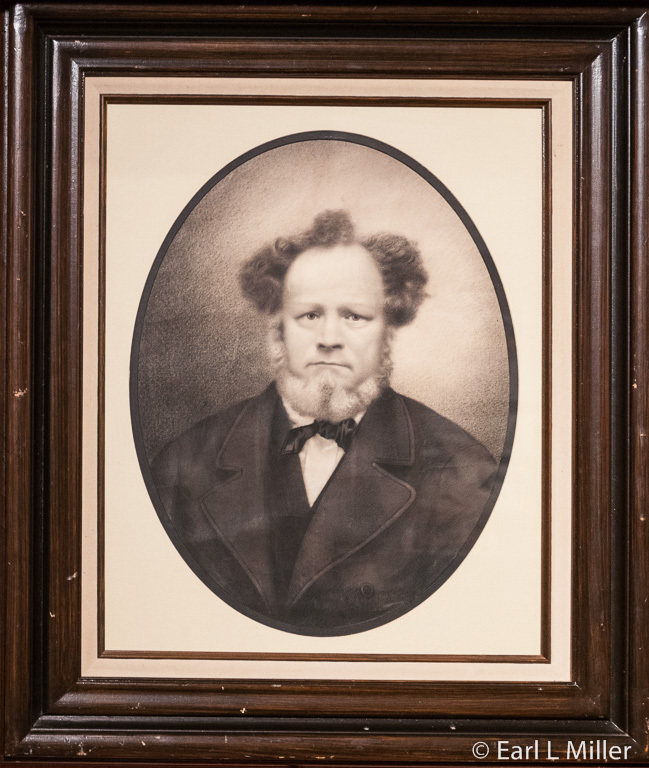 In 1837, he moved to the Pittsburgh district with his wife and son, Willie. In Harmony, Pennsylvania, he discovered an interest in communal living and became active with the group headed by George Rapp. Soon 30 Rapp Colonists joined with Keil and became the backbone of his new organization. Where Rapp believed that because the coming of Jesus was imminent celibacy should be practiced, Keil rejected that view. In 1844, Keil moved part of his group to Bethel, Missouri. In 1856, after sending out a dozen scouts and considering a site in Willapa Bay, near present day Menlo, Washington, they decided, because of better agricultural land, to instead develop Aurora. It was the only religious Christian communal society to cross the Oregon Trail and settle on the West Coast. Keil named it Aurora Mills after his daughter and the sawmill and gristmill built in 1847-1848 by Dave Smith and George White. It was with these two men that Keil entered into a contract for their holdings within a few years of establishing Aurora Mills. Keil had promised his son, Willy, that he could lead the wagon train. Unfortunately, Willy died shortly before the group left Missouri. Willy’s body, housed in a lead-lined coffin filled with whiskey, led the procession. His body was buried at Willapa Bay, six months after the caravan left Bethel. During the next twelve years, five ox-mule wagon trains moved almost 600 colonists, mostly Germans and Swiss immigrants, from Missouri to Aurora. Keil’s promise of plenty of work, where everyone would be provided for, proved appealing to his fellow immigrants. Family units were strong with many descendants living to this day in Oregon. The Bethel-Aurora colonists followed no particular religious denomination. Their creed was “Love one another and be helpful to one another.” They lived by the Bible code found in Acts 2:44 in the New Testament “Ye shall have all things in common.” Therefore, common ownership and equality formed the basis for their community. It became a labor of their choosing in return for receiving supplies. They built homes, barns, shops, a woolen mill and a tannery. Culture was important with education valued for both sexes. For the more advanced students, graduates of German universities conducted schools of music, science, and classical languages. Other teachers held craft lessons in weaving and the building trades. The village became nationally famous for its band and hotel food. The settlement flourished as a communal unit until Keil’s death on December 30, 1877. It was dissolved by 1883 with the final distribution of property and other assets held in common by its members. 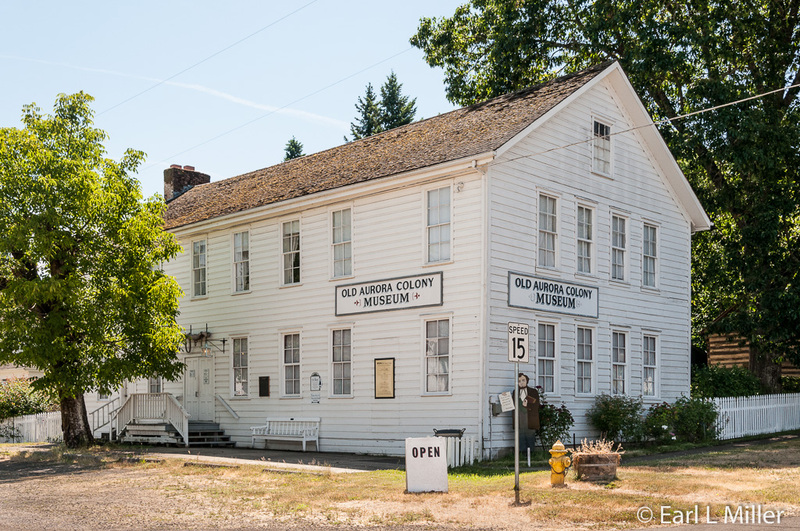 It’s worth the drive to Aurora to see the Old Aurora Colony Museum consisting of five buildings. These are the Ox Barn, Steinbach Cabin, Kraus House, Will Family Summer Kitchen and Wheelwright Building. 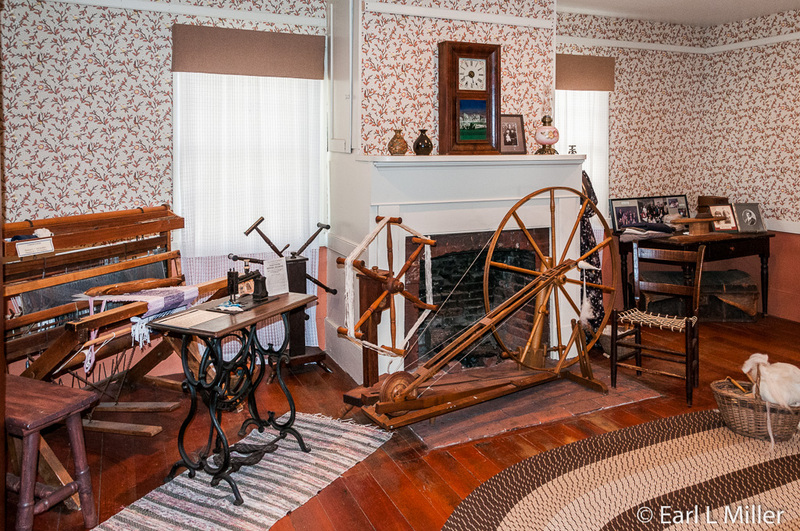 Here you can learn about the lives of these colonists, see artifacts and furniture, and tour some of their preserved homes. It’s located at 15018 2nd Street NE (one block east of Highway 99E). The best time to see it is during one of their several scheduled events throughout the year when there are hands-on living history experiences and costumed volunteers. Next best is to call them at (503) 678-5754 from 11:00 a.m. to 4:00 p.m. to arrange for a guided tour, Tuesday through Saturday, or noon to 4:00 p.m. on Sundays. These are approximately an hour long. You’ll hear stories about the colonists and have questions answered which are not available by taking a self-guided tour. You’ll start your visit at the Ox Barn. Constructed in1860, it’s the only building on its original site. It housed the community’s horses, cattle, and oxen that had moved with the settlers from Missouri to Aurora. The oxen also hauled logs for the construction of buildings and helped plow the land needed for crops. 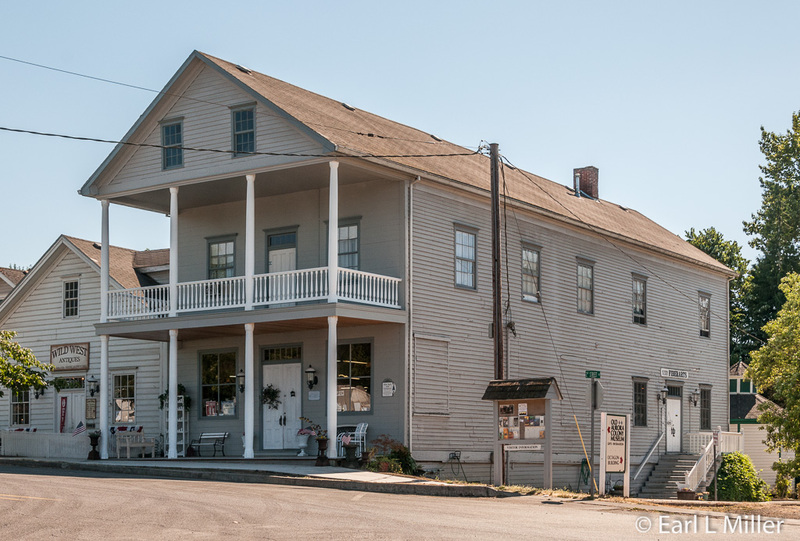 The Frederick Will family converted it to a store when it was no longer needed by oxen. During the 1900's, it was the home of the Ezra Hurst family. In 1963, Amy Hurst sold the building to the newly organized Aurora Colony Historical Society. After renovation, they opened the building to the public as the Ox Barn Museum in 1966. It was renamed The Old Aurora Colony Museum in 1988. First view a 9-minute introductory video providing a good oversight of the colony’s history and what you will be seeing. Permanent museum exhibits are on the Aurora Brass Band, the Colony Church, Dr. Giesy’s Drugstore, the Pioneer Hotel, and the school. You’ll see artifacts on all of these and learn about the group’s famous families. 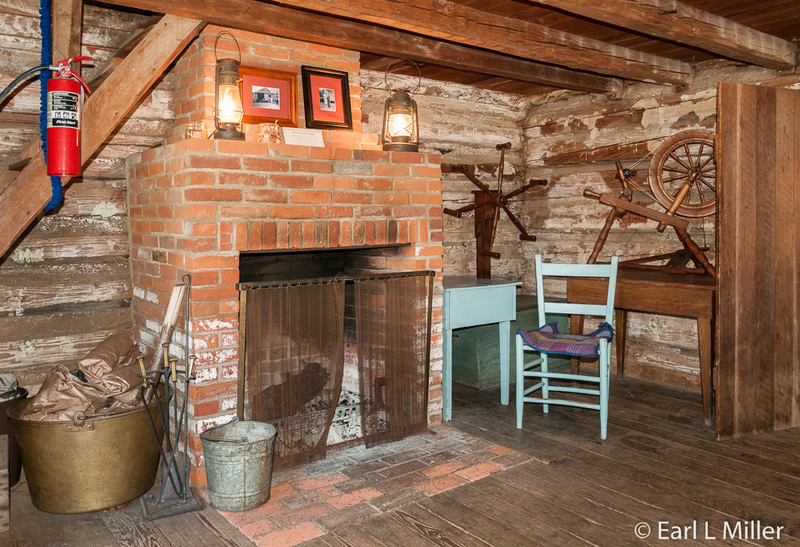 You’ll learn the colonists made their own furniture, tinware, and baskets. The furniture, which reminded me of the Shaker Style, was often painted their favorite color, Prussian blue. 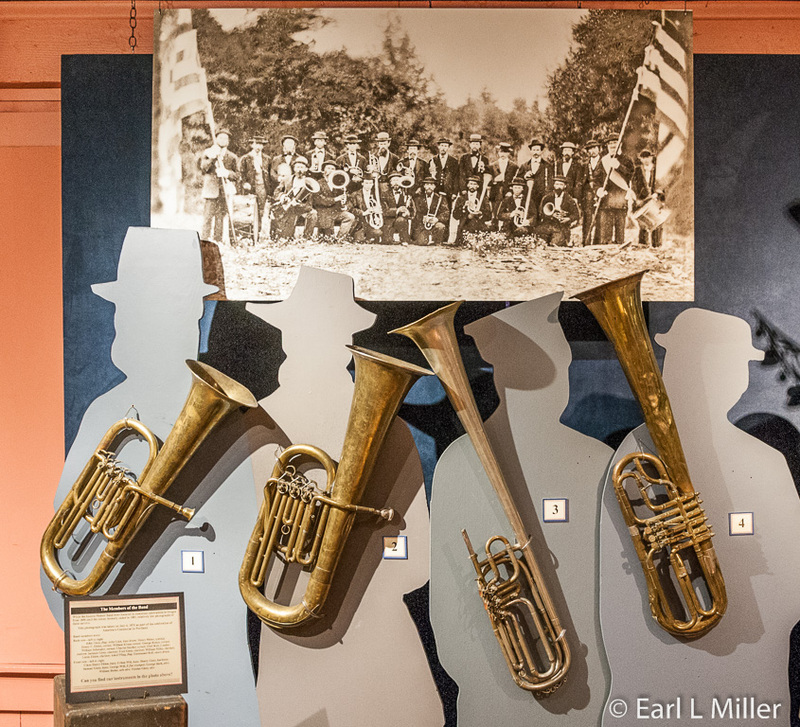 The Aurora Brass Band became Oregon’s state band. It headlined on July 4, 1876 the celebration of the American Centennial in Portland. They often took first prize in brass band competitions and were in demand for fairs, political rallies, and ceremonial functions. They played into the 1920's. At the museum, two walls are dedicated to their instruments. 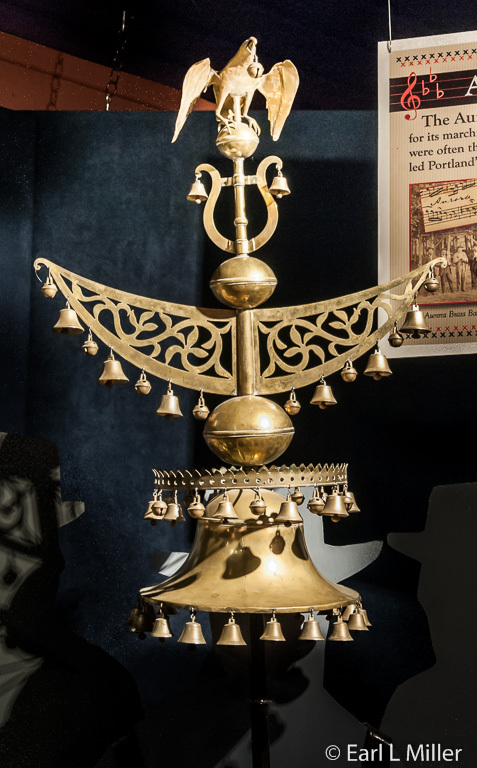 Be sure to note the Schellenbaum, a brass bell tree, which was at the head of each of the band’s processions. Much of their original music has also been recovered. The Aurora Colony Historical Society won the coveted National Award of Merit from the American Association for State and Local History for efforts to preserve and disseminate original music. As early as 1860, Keil turned a portion of his “Great House”, the home for himself and his family, into a hotel and restaurant for travelers. It served as a stagecoach stop between San Francisco and Portland. In 1867, when the railroad arrived, he had the colonists construct the large Aurora Colony Pioneer Hotel which soon became famous for its sausage and ham dinners. Visitors often came on Sundays to have a German meal and be entertained by the band playing from the hotel’s widow window on the rooftop. Jacob Giesy managed the hotel until 1881 when he purchased the business and continued running it privately until his death in 1904. In later years, the hotel housed a meat market, a saloon, and private residences. It was torn down in 1934 when 99E came through. You can see, at the museum, dinnerware and a menu from this hotel as well as some photos. Another significant building was the church which opened in 1867. The focus was less on doctrine with more attention given to the gospel. The bell tower was 114 feet high with an observation balcony that fit the 60-piece band. It was not attended after the colony disbanded. 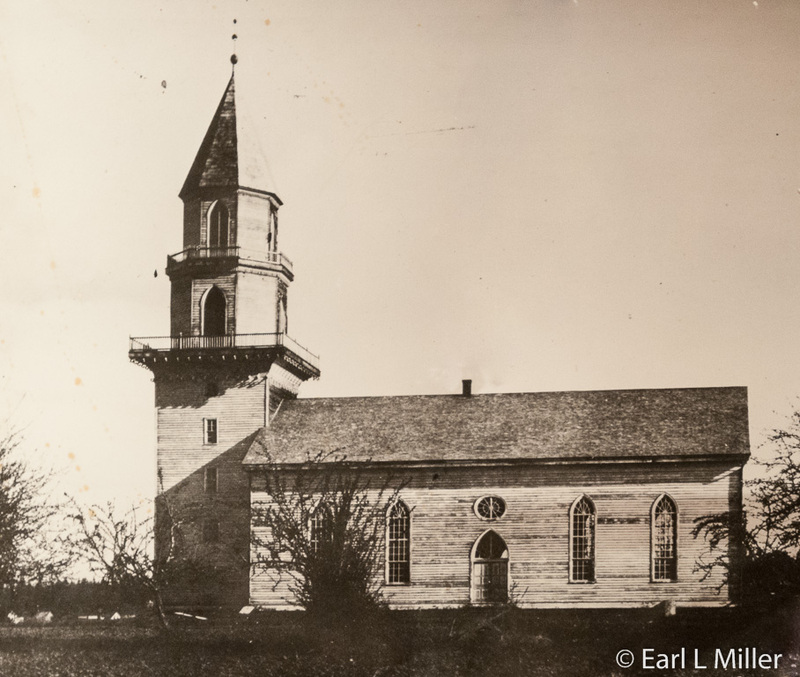 The community tore it down in 1911 when the spire began to fall into disrepair. On display at the museum are the church’s glass pane and one of its three bells. The Giesys were a family of doctors. Dr. Martin Giesy owned the drugstore. An exhibit consists of the his and his son’s medical instruments and an original drugstore cabinet. 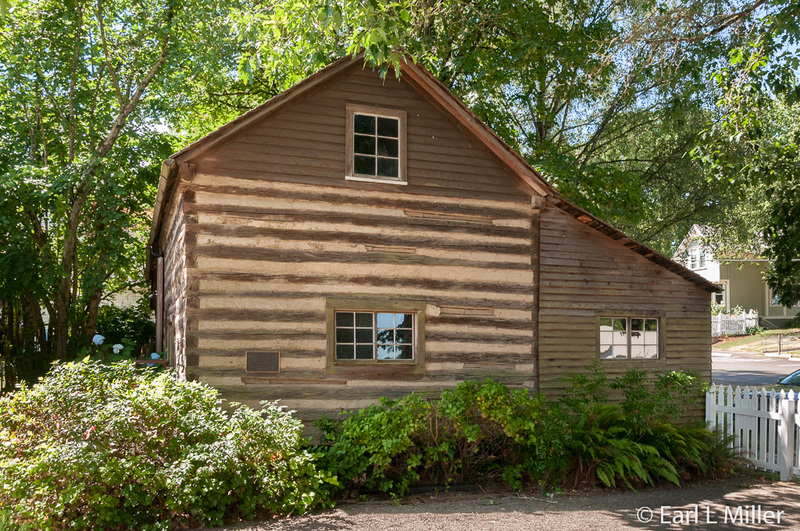 The Steinbach family log cabin is one of three log cabins surviving from the colony. It is constructed of peeled and hand-hewn cedar timbers chinked with mud, straw and manure. George, and his wife, Catherine Miley Steinbach, lived in the cabin with their five children from 1876 to 1883. After the colony disbanded, they built a frame home. The cabin was moved nearly three miles from the Willamette Valley to its home at the museum. Constructed in possibly the late 1860's, the Kraus House was given to the historical society by the Kraus family who lived there from 1879 to the mid’s 1960's. Strong evidence suggests that members of the Giesy family lived here during the 1870’s. George Kraus’s wife, Elizabeth, was the daughter of John Giesy, who was administrator of colony business relationships with nonmembers. Kraus was a bootmaker while Elizabeth was head of the tailor shop. It’s also possible that Emma Wagner Giesy, one of Kiel’s original scouts, also lived in the house for some time. It’s a typical colony home constructed in the board and batten style from wood cut at the saw mill. It was moved two blocks to the museum. The livingroom wallpaper is a replica of the original. The organ is the only original piece of furniture. In 2006 and 2007, the historical society opened the Wheelwright building. It houses the woodworking shop, a blacksmith shop, and a space for the wheelwright to make the wheels that would have been needed for the colony wagons. They also reconstructed the original wood lathe which is demonstrated at special events. 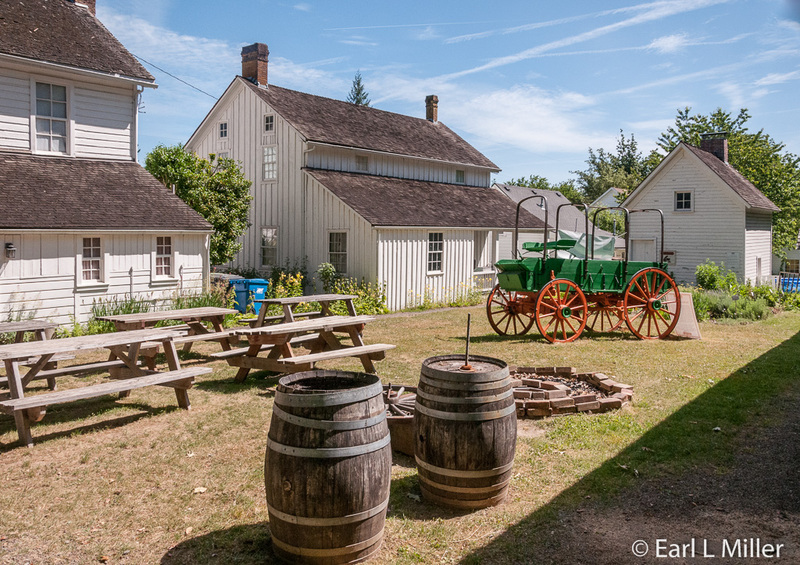 Be sure to notice the original grist mill grinding stones, two of the 1849 church bells, and the wagon restored in 1993 by the Aurora community to reenact Willie Keil’s crossing of the Oregon Trail. You can look into but not enter the Will Family Washhouse, originally known as the summer kitchen. It provided a separate place for Aurora families to do laundry and make sausage, sauerkraut and apple butter. Several families worked together to provide for their own needs as well as produce for the colony. This house, associated with the Leonard Will family, was donated to the historical society by their descendants in 1977 and moved from across the street to become part of the museum complex. Check out the sausage stuffer on permanent display. The herb garden is similar to ones at the time of the Aurora Colony. The herbs are also the same kinds as those planted at the Old Economy, Pennsylvania garden, a town where many of the colonists first lived. You’ll see such plants as English thyme, Lemon thyme, and many medicinal herbs. It’s taken care of by the Willamette Valley Herb Society. To see other buildings that have survived, pick up a copy of “Emma’s Walk”, a walk brochure and map, at the museum. It points out 28 historical sites. Another option, which we did, is to drive the route. Of particular interest is Jacob Miley’s log house built in 1867 and the Wm. Keil and Company Store dating to 1872. It is currently an antique store, one of several in this community. 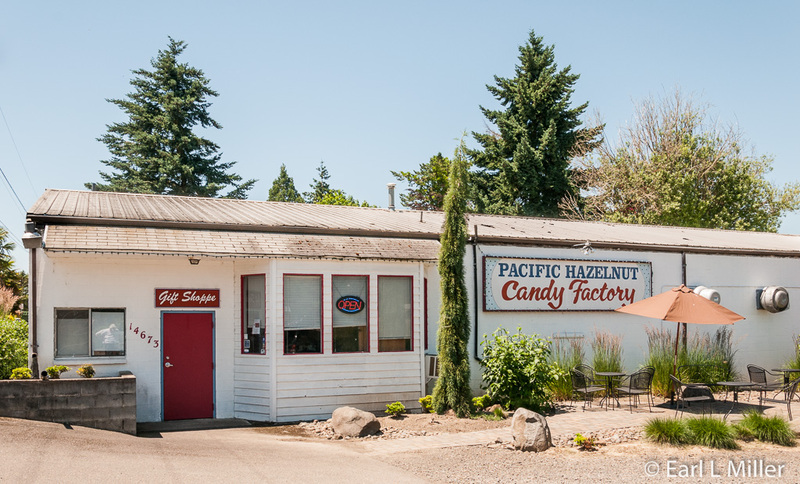 Pacific Hazelnut was started by farmers, Joan and Ersel Christopherson. They had made candy in their kitchen and received great success when their story was told in “Bon Appetit” magazine. Andrew Halls purchased the company five years ago. It is now the largest producer of chocolate-covered hazelnuts in the Pacific Northwest despite only having an employment of three people. From September through Christmas, when they produce 60% of their candy, they employ six or seven. After watching a film on how they make their product, Andrew gave us a tour of the process. We learned that Pacific Hazelnut purchased their crop from processors, Northwest Hazelnuts and the Hazelnut Growers of Oregon. This makes sense since 98% of all hazelnuts are grown in the Willamette Valley. The nuts are harvested in September and October. They arrive vacuum packed from the processors so they can last 12 months after they are received. The process starts with roasting the hazelnuts for roughly 20 minutes. They’re placed on trays, each holding 35 pounds, then put into the oven. The next day, the hazelnuts are dehusked. The crop determines if all or part of the husk comes off. The factory tries to take off as much as they can. However, sometimes a little husk is left on. They’re tumbled for 12 to 15 minutes. 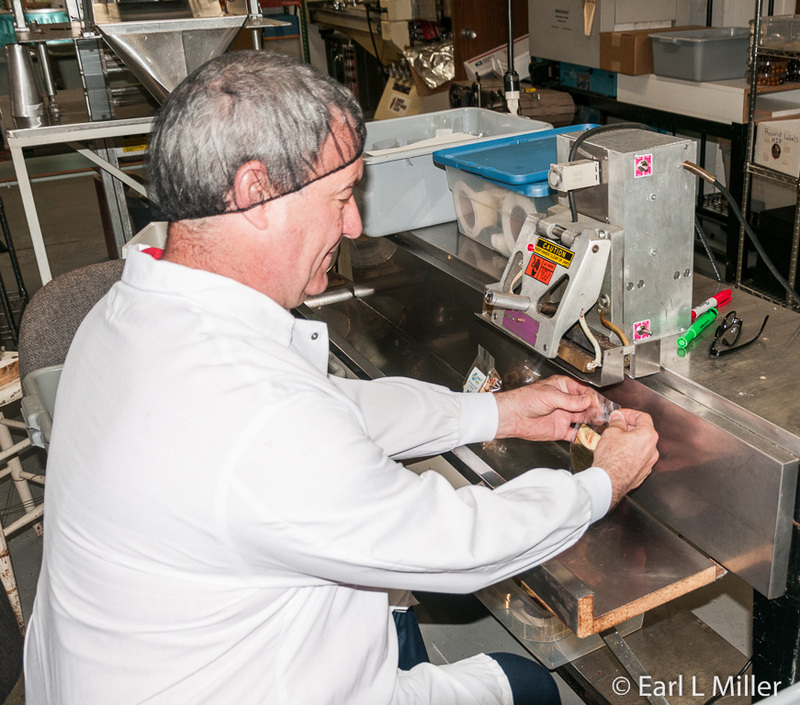 They are next inspected as much as six times for quality. Sometimes the nut has mold or small hazelnuts are still in their shells. These must be removed. 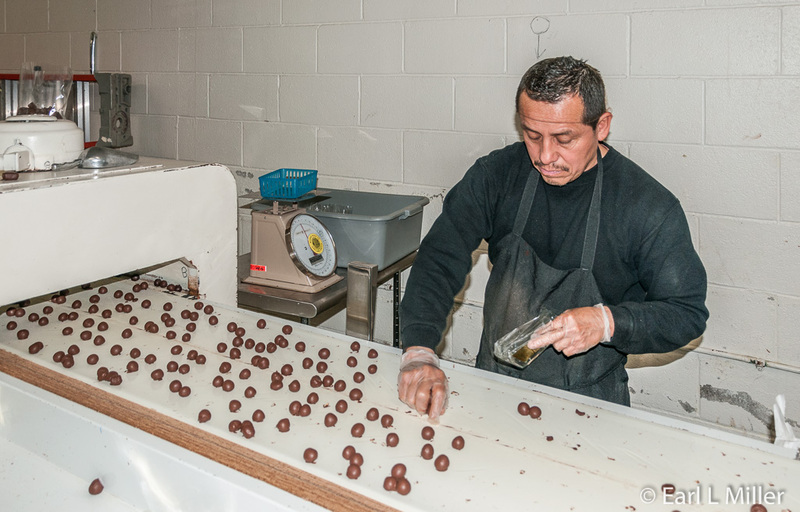 A hazelnut is about the size of a quarter so the shells are removed by a processor. 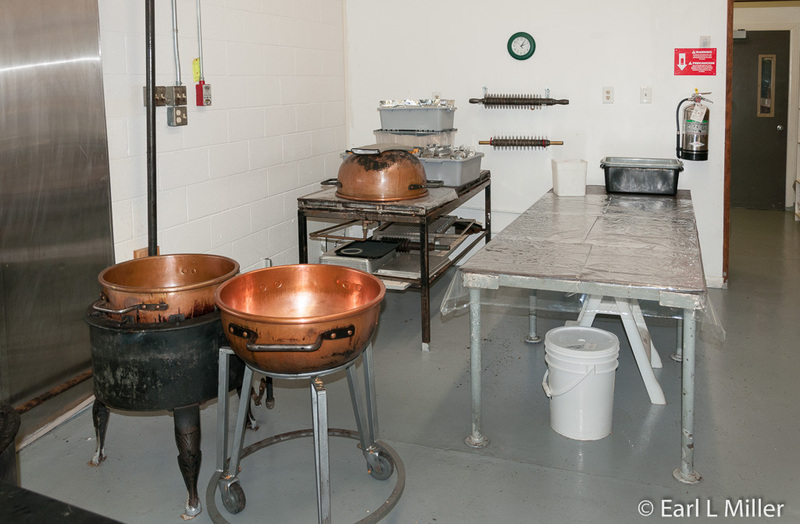 The first step in adding chocolate is done in the stainless steel drums called pans. This room is air conditioned at a temperature of 55 degrees and 30% humidity. 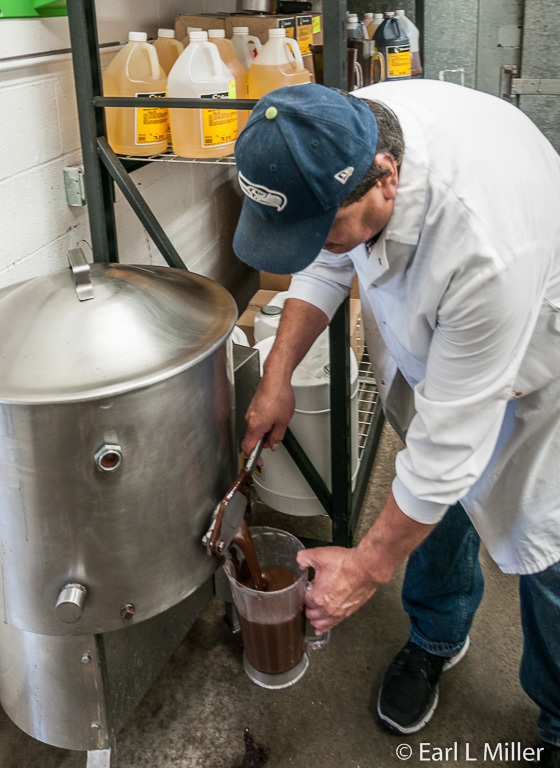 The chocolate is melted then drizzled onto the cold product, with the chocolate solidifying as soon as it hits. The pans go round and round making the pieces round. The next step adds a confectioner’s glaze to make the chocolate shine. The ribs distribute the chocolate glaze evenly. “Getting the right amount of chocolate is an art,” Andrew informed me. Some products are double dipped with chocolate. These go through a line involving an enrobing machine. It uses the same chocolate as the panning. 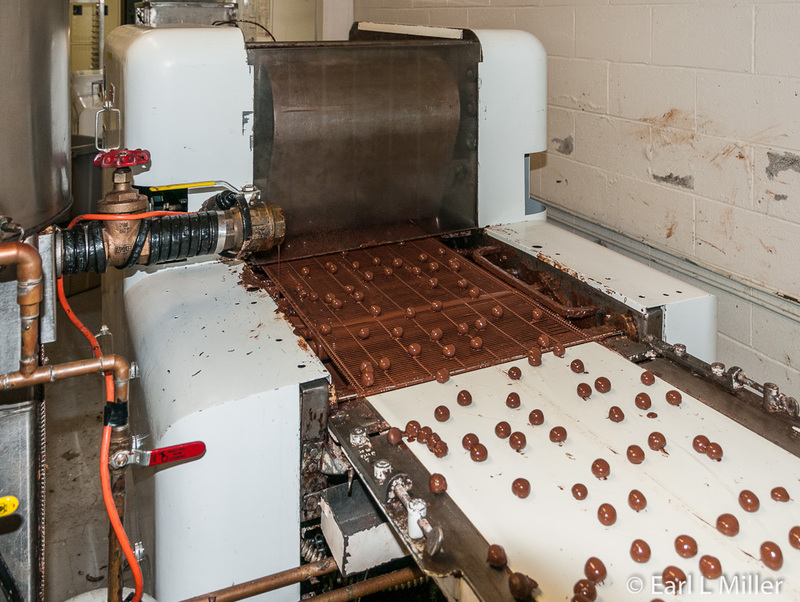 Chocolate in the enrobing is added at 89 degrees and then cooled at 68 degrees. If the process is not done correctly, the butter in the chocolate comes to the surface and turns white.This is called blooming. 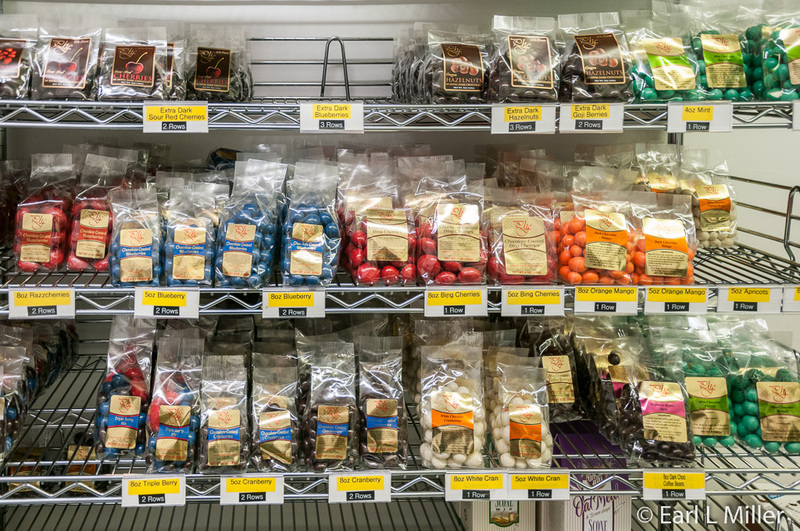 Chocolate is also added to dry fruits such as blueberries, raisins, cranberries, apricots, cherries, even mangoes. Sometimes they make white chocolate-covered fruits and nuts. Making toffee is a different process. 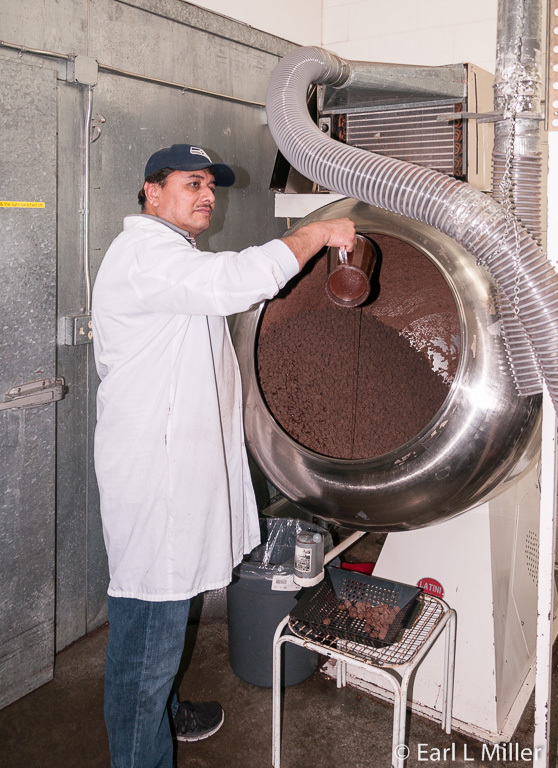 Pacific Hazelnut uses 16 pounds of butter and 16 pounds of sugar. It’s cooked in copper kettles for 30 minutes at 360 degrees. Staff watches for the right color to appear. It must be flaky not chalky. The mixture is poured on a table where it sets for 10 minutes. After the top is scored, it is left for 30 more minutes. The toffee is now set. It’s broken into squares and enrobed with chocolate. Seasoned nuts are treated differently. They are fried in Canola oil at 360 degrees then seasonings are added. The procedure is a very quick dip in, dip out of the oil for about a second. They are removed from the oil when they sizzle. Finally, all products are bagged by two filling machines. One is automatically run while the other is manual. Then they go through a sealing machine. A labeling machine applies the labels. If they’re private-label or if the order is for only a couple of cases, they’re packed by hand. They’re sold to Made in Oregon Gift Shops, the Aurora Colony Museum, other gift shops, and on line. Bad ones called “Bloopers” are sold in the store at a discount. Visiting the gift shop after your tour is a must. You’ll receive delicious samples which will lead you to a difficult choice of what to purchase. That’s because they make so many different products in different sizes. 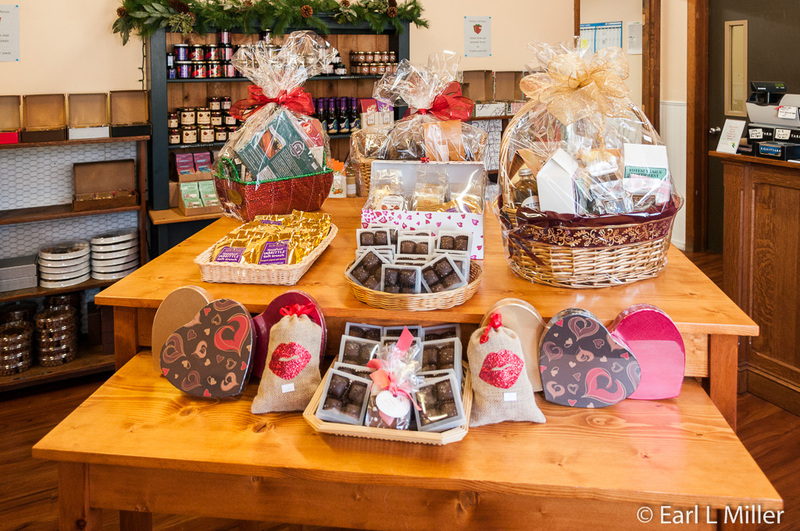 Including gift baskets and sugar free candies, they manufacture over 100 types. To take a tour of the plant, it is necessary to make an appointment. They are open Monday to Saturday 10:00 a.m. to 5:00 p.m. Pacific Hazelnut is located at 14673 Ottawa Road N.E. Their telephone number is (503) 678-2755. To find out more about this company or see a listing of their products, check them out at www.pacifichazelnut.com. If you want to have lunch, while in Aurora, head for Fir Point Farms opposite the airport. 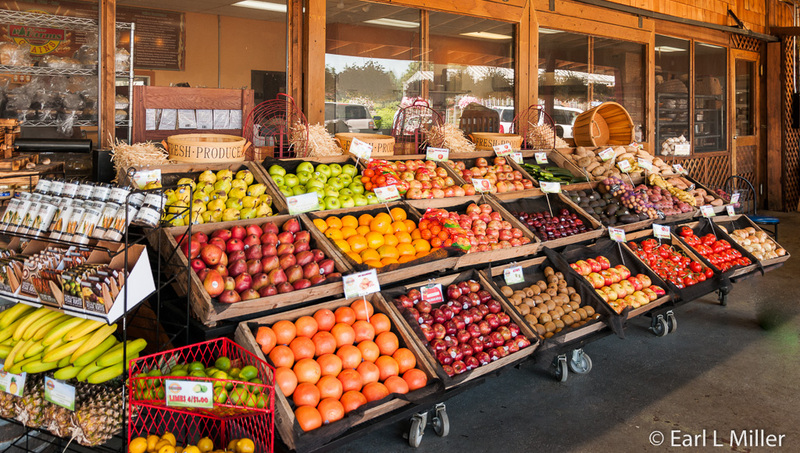 It’s a country store on a farm selling fresh vegetables and fruits; daily homemade baked products including cinnamon rolls, doughnuts, and banana bread; jams and jellies; and fresh pies. They also have a line to order sandwiches using a variety of their own breads.You can order sandwiches including ones with their own roasted turkey and pork or other selections such as chilli and soup. They sell Tillamook ice cream which is regarded by many as the best in Oregon. I ordered the turkey with cream cheese and cranberry. It came with chips, a cookie, and an incredible flavor. May through August their hours are 10:00 a.m. to 3:00 p.m. Closed Sundays and Mondays. For other months, the hours are different. Their address is 14601 Arndt Road in Aurora and their phone number is (503) 678-2455.